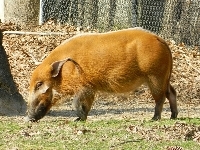 Red River Hogs are also known as bush pigs. Red River Hogs are the reddest of all pig species. Red River Hogs are about 3 1/2 to 5 feet long. 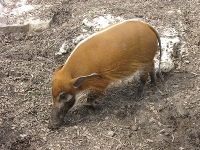 The Red River Hog is nocturnal. The Ted River Hog is an omnivore. Red River Hogs are social animals and form bands of 50 or more animals.